We explore Halloween as a uniquely constructive space for engaging racial concepts and identities, particularly through ritual costuming. Data were collected using 663 participant observation journals from college students across the U.S. During Halloween, many individuals actively engage the racial other in costuming across racial/ethnic lines. Although some recognize the significance of racial stereotyping in costuming, it is often dismissed as being part of the holiday's social context. We explore the costumes worn, as well as responses to cross-racial costuming, analyzing how “playing” with racialized concepts and making light of them in the “safe” context of Halloween allows students to trivialize and reproduce racial stereotypes while supporting the racial hierarchy. 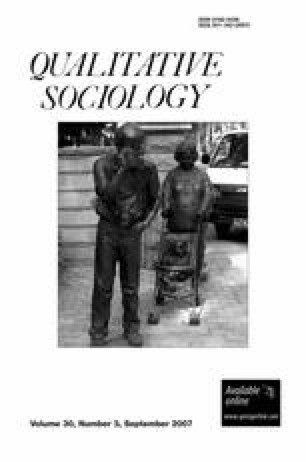 We argue that unlike traditional “rituals of rebellion,” wherein subjugated groups temporarily assume powerful roles, whites contemporarily engage Halloween as a sort of “ritual of rebellion” in response to the seemingly restrictive social context of the post-Civil Rights era, and in a way that ultimately reinforces white dominance. A previous version of this paper was presented at the 2005 annual meeting of the American Sociological Association in Philadelphia, PA. The authors wish to thank Joe Feagin, Ashley Doane, Terence Fitzgerald, Glenn Bracey, and Kristen Lavelle and the TAMU Sociology Department's “Meet the Critics” group for their invaluable feedback. Jennifer Mueller is a doctoral student in sociology at Texas A&M University. Her research interests include racial and ethnic relations, historical foundations of U.S. racism, whiteness, and culture (particularly popular/media culture). She is currently investigating how the intergenerational transmission of capital among U.S. families is influenced by the larger societal institutional context and how this has served as a means for the social reproduction of the racial hierarchy. Danielle Dirks is a sociology doctoral student at the University of Texas at Austin. Her research interests include racial and ethnic relations and criminal justice issues related to incarceration and the death penalty. Her recent work has examined the issue of “closure” related to the impacts of the death penalty in Texas. Leslie Picca is an Assistant Professor of Sociology at the University of Dayton. Her areas of interest include racial/ethnic relations, sexualities, symbolic interactionism, and structures of privilege (especially whiteness). She is currently finishing a book, Two-Faced Racism: Whites in the Backstage and Frontstage, (Routledge, expected April 2007) with Joe R. Feagin.